“Deluge or Drought? 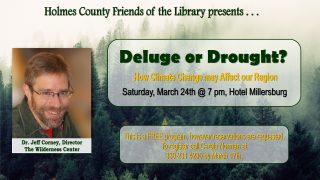 How Climate Change may Affect our Region” will be presented by Dr. Jeff Corney, Director of The Wilderness Center at the Hotel Millersburg. Reservations are requested by March 17th for this FREE program presented by the Holmes County Friends of the Library. To register call Carole Norman at 330-231-4230.